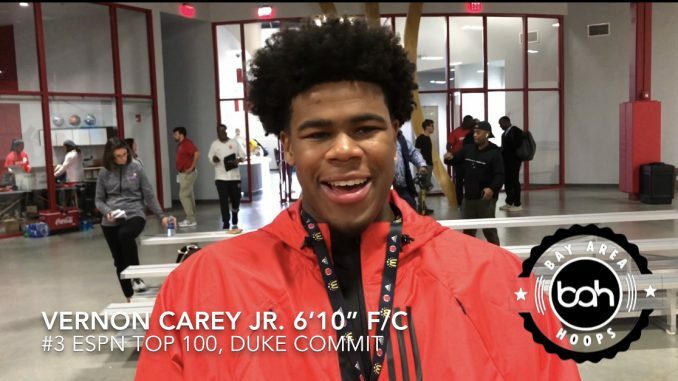 Chamblee, GA.- Watching the McDonald’s all-Americans practice in front of numerous NBA scouts and Media, you’ll notice 5 star Duke commit Vernon Carey Jr. on the sidelines. The Duke commit has been out for about 3 weeks with an ankle sprain and decided not to participate in the McDonald’s game on Wednesday March 27th. He talks about rehabbing and Duke with us, lets hope he’s healthy enough to see him at the GEICO High School Nationals with the NSU University School (FL) come April 4-6 in New York. Story by Reginald Burke Sr.